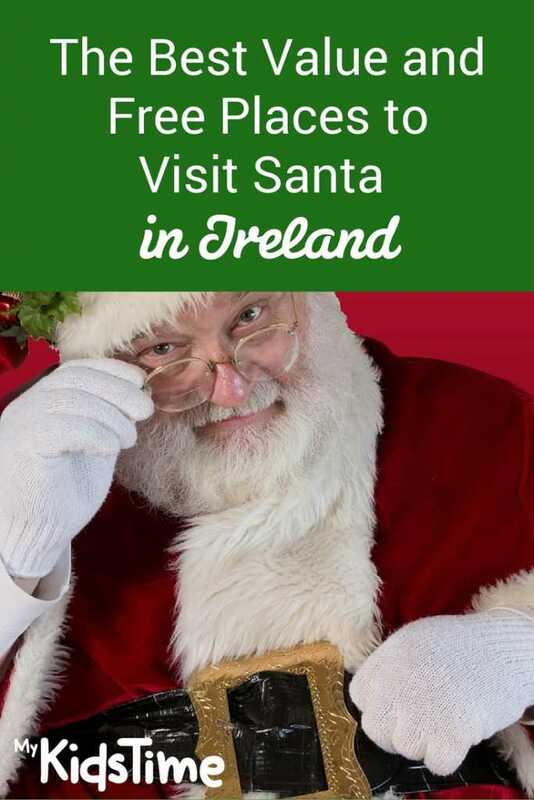 Are you looking for value or free places to visit Santa in Ireland? Christmas can be an expensive time of year so we are always on the look out for ideas to save you money. We have put together the best value and free places to visit Santa in Ireland this Christmas so everyone can have a very merry Christmas. Our criteria to be included on our value or free places to visit Santa in Ireland was €15 or under per child. 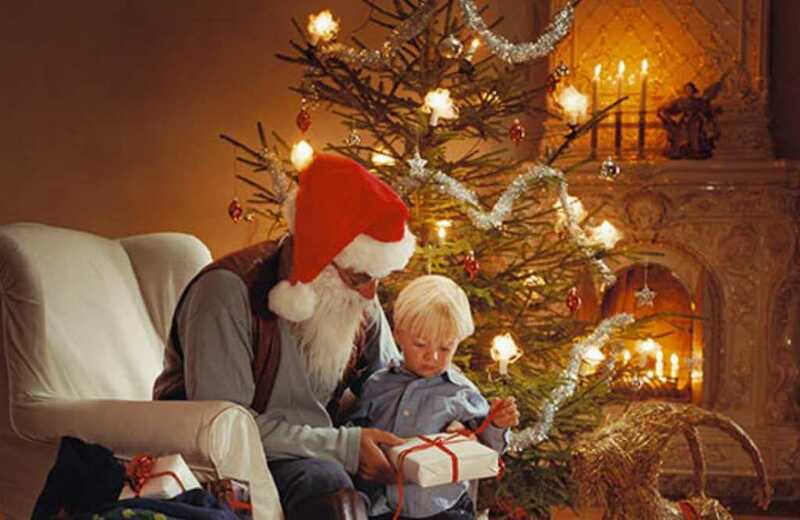 Bring the little ones to visit the man at IKEA in Dublin, and they can enjoy some festive activities while they visit. Dates: Every weekend 24th November – 16th December, 10am – 4pm, and 19th December – 23rd December, Monday – Friday 10am – 4pm. Santa’s grotto is located in the main entrance. 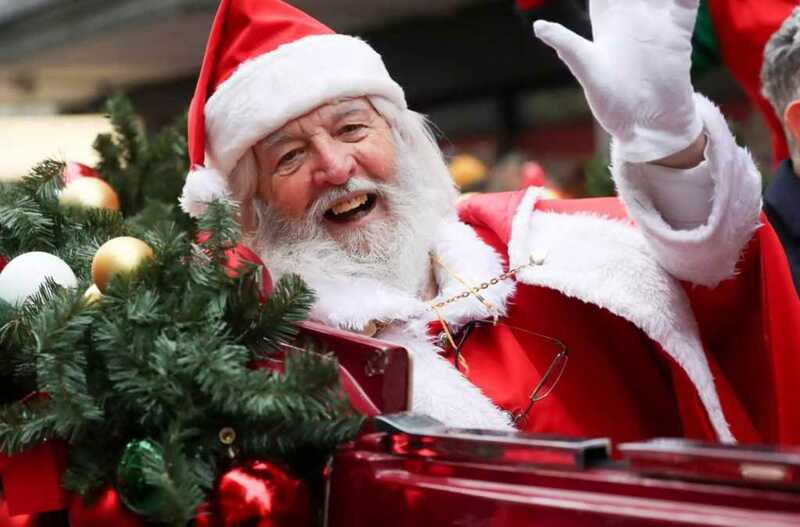 Santa will be visiting Kildare Farm Foods on weekends in December from 10am to 5pm each day. He will be there on December 1st, 2nd, 8th, 9th, 15th & 16th December 2018. 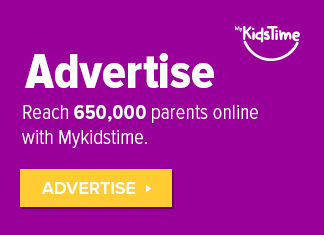 Visits to see Santa are free, and every child gets a free gift too. No need to book. The Phoenix Park Rangers offer a talk for children & a meet and greet with Santa. The event is free and no booking is required. It takes place on Sunday 2nd, 9th & 16th December 2018 at 11am and 2pm. 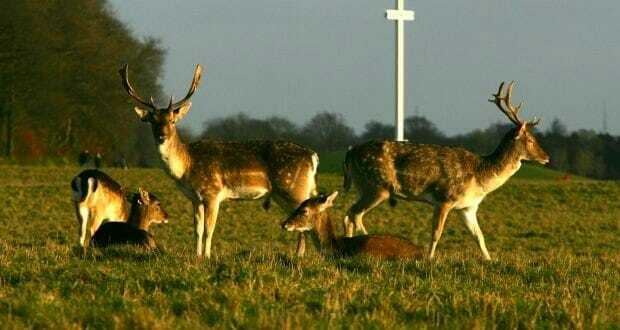 Meet at the Papal Cross in the Phoenix cross where the rangers will give a talk about the history of the park and the deer in it. Santa will then come for a meet & greet. Visit a Horkans Garden Centre in December to post your Santa letter in the special Santa Post Box located in the Christmas Winter Wonderland area. You may also spot Rudolph and some of his friends getting ready for the busy season ahead. Santa will collect letters in Horkans Castlebar every Saturday at 3pm from December 1st to 23rd. Children can enjoy hot chocolate at Horkans Wicklow and Galway every Friday, Saturday & Sunday evening in December too. Santa and his friendly helpers will be welcoming visitors at the Whitewater Shopping Centre, Newbridge, Co. Kildare from November 17th until December 24th. Meeting Santa is free for all. Instead of paying to visit Santa, donations can be made to Down Syndrome Kildare. Free Santa visits at Perks Entertainment Centre, Youghal take place every Saturday & Sunday from 2-6pm starting from November 17th. Come visit Santa at his grotto and bring your Santa letter. 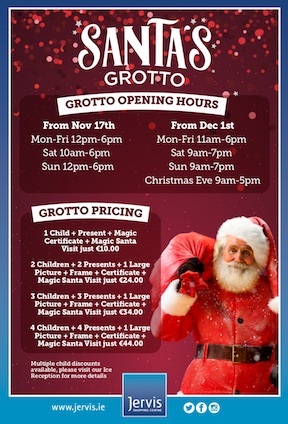 Santa is in Blackrock Centre, Dublin every weekend, it’s free to visit Santa’s Grotto, each child gets a free gift. Children will be able to visit Santa and his friends for free every Saturday and Sunday at Manor West Retail Park, Tralee from 12-6pm, right up to Saturday, December 23rd. Santa will arrive at Arnotts on November 18th 2018 at 2pm. You’ll find Santa’s Grotto on the Second Level of Arnotts. The “Virtual Santa Q” means you don’t have to spend hours waiting in line to visit Santa Claus. Tickets are allocated on a first come, first served basis each day so you can get your Santa Q ticket when you arrive and they will let you know when it’s almost time to meet Santa Claus so you have plenty of time to make your way to the Grotto. Visiting Santa Claus is free* and includes an I’ve Seen Santa badge for each child. There is a photographer at Santa’s Grotto available to capture a photograph of your visit which you can purchase as a souvenir. * This year, Arnotts are asking for a donation of €5 per family for visiting Santa. 100% of this donation will go to Pieta House and St Vincent De Paul. Santa’s Christmas Wonderland is nestled beneath the forest canopy in the grounds of the Bel Air Hotel, Ashford, Co Wicklow. The event runs from November 29th to December 23rd 2018 inclusive. We guarantee a real traditional Christmas experience in a beautiful woodland setting. Tickets are €16 per child (12mths to 15 yrs), which includes a personal passport and a present from Santa. Santa’s Christmas Wonderland is fully wheelchair accessible. The Santa Experience is a tour through the North Pole where children will learn how Santa and the elves prepare for Christmas and will interact with elves, reindeer, polar bears and may even get to ride in Santa’s Sleigh on their way to meet the big man himself in his authentic log cabin! Children will be amazed by what Santa knows about them, thanks to the Santa Needs to Know forms, filled in at the time of booking. 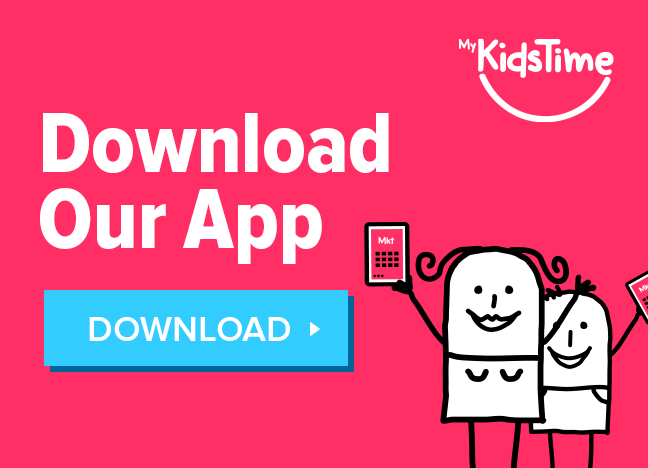 Tickets cost €10 per child & €3 per adult and can be booked online in advance to ensure you get your preferred time and date. Each ticket includes meeting and interacting with Elves and Santa, travelling through 5 fun filled festive rooms, and a beautiful gift to treasure. A professional photographer will be on hand to capture all magical moments and you can order 8 x 10 framed prints immediately afterwards if you wish. The first print is priced at €12 and subsequent prints will be priced at €6 per print. 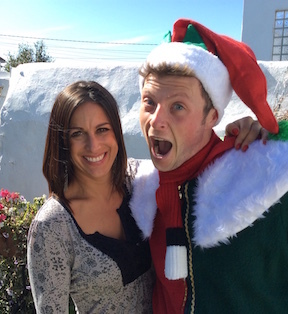 Book your visit to the Santa Experience today. Also on December 7th from 3pm to 6pm there is a special Quiet Santa Evening for children with sensory and special needs. Email [email protected] to book your place. Santa arrives to his new Magical Castle in Jervis Shopping Centre at 11.00am on Saturday 17th November. There will be FREE magical festivities throughout the day from 11.00am – 3.30pm. After that Santa will be seeing visitors in his grotto during November from 12pm to 6pm Monday to Friday and from 10am to 6pm on Saturdays and 12pm to 6pm on Sundays. 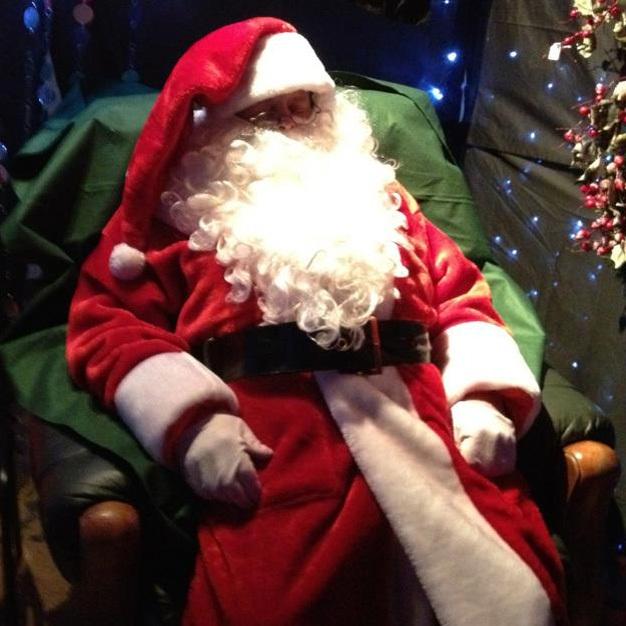 From December 1st he will be in his grotto from 11am to 6pm Monday to Friday and from 9am to 7pm every Saturday and Sunday up to Christmas Eve. He finishes early on Christmas Eve at 5pm so he has time to get home to the North Pole for deliveries! 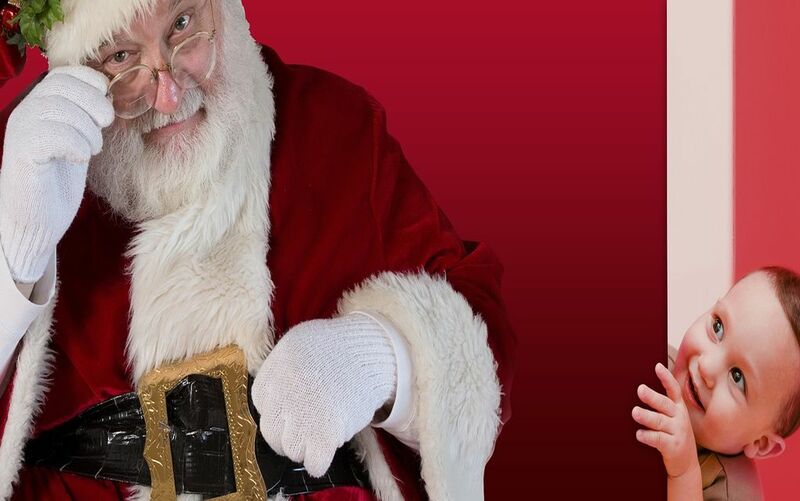 Prices to see Santa at Jervis Shopping Centre start from just €10 which includes; a magical visit with Santa, a present and a magic certificate. Conjure up the real magic and wonder of Christmas with Santa’s Christmas Magic at Brigit’s Garden on various dates from December 2nd to 23rd 2018 Santa and Elfie are back with lots of extra fun activities! 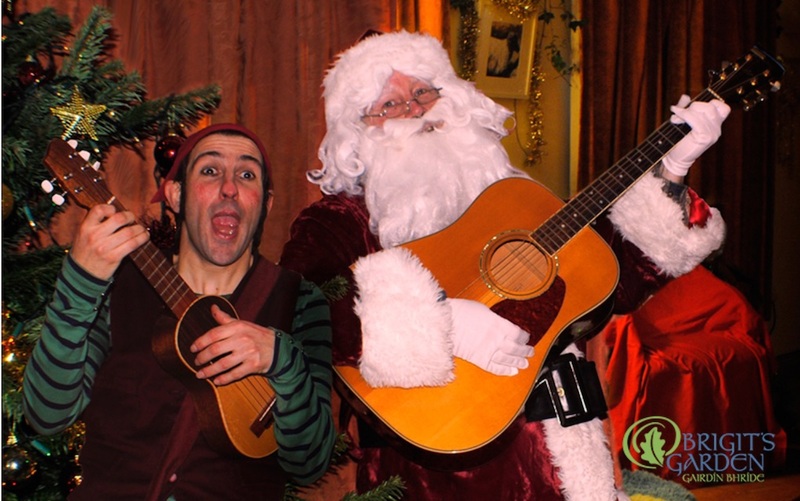 Elfie and Santa will be joined by Mrs Claus and Donnie the donkey to make a full Santa experience with the professional show as the delightful highlight of the day, with lots of music, fun, candlelight and Christmas magic! Visits last approx. 2.5 hrs and favourites include; making Christmas decorations with Mrs. Claus, singing with Elfie, lighting candles with Santa, enjoying mulled apple punch, a treasure hunt around the Celtic garden to find Elfies lost presents and of course the highlight of the show when everyone lights the Christmas tree with magic. This is a great value Santa experience and under 3s are free if they sit on an adult lap for the Show. 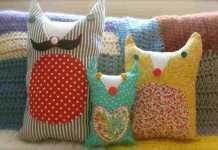 Brigit’s Garden members also receive a 10% discount. 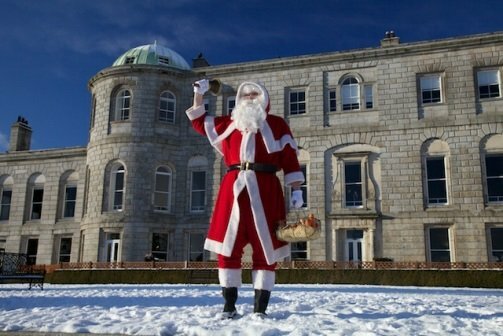 Santa will be at Powerscourt Estate, Wicklow from November 24th to December 23rd 2018. In addition to their visit with Santa, families can visit the stables and see some of Santa’s animals including, Santa’s deer, pygmy goats, donkeys, rabbits and guinea pigs! Rudolph will make an appearance too! Treat your children to a magical Christmas experience with Green Santa at Belvedere House, Westmeath. Green Santa will arrive by boat across Lough Ennell to Belvedere House and proceed to his magical grotto, where he will help the children pot up seasonal native Irish trees which the children can plant in their gardens at home. The tree grows alongside the child at home and can be a lifetime memory of that special visit to Green Santa at Belvedere. Other Green Santa treats include Wildflower seed shakers for attracting fairies and flutter-bys into your garden and old fashioned Victorian Candy. Runs weekends from December 1st to 16th. Santa will be visiting Lough Key in Roscommon for one day only in December, where he will be welcoming children, along with his elves and husky dogs! Kiddies will receive a gift and a hot chocolate! And there will be face painting and carols to enjoy. Enjoy a magical time in the Athenry Heritage Centre’s Winter Wonderland with a one hour Santa Experience that includes a range of festive craft activities for all the family to enjoy. The Elves are waiting for all the boys and girls to help them enjoy their activities and Santa is waiting with a gift for the children to take home. Parents of young babies and toddlers can also enjoy their Santa experience with morning opening times just for you. Santa has a special gift too. Doors open from 10:00am-12:00pm. No pre-booking is necessary. Admission for the Babies & Toddlers is €10.00 per child and €5.00 per Adult. 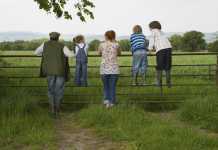 The big man visits Clonfert Pet Farm in Co. Kildare in December when kids can visit Santas Workshop, Cowshed theatre and of course meet Santa and Mrs. Claus. Visit Donegal’s Lapland at Doagh Famine Village on dates from November 23rd to December 22nd 2018. See a live show and visit the elves in Santa’s Workshop and Toy Factory and receive a special gift from the big man. Take to the skies with Santa this Christmas at Atlantic Airventures, Shannon. Meet Captain Santa Claus on the flight deck of his BAe146. Visit Captain Santa Claus at the Flight Deck + Gift (Under 7, No Flight Simulation included), tickets cost €15.00 per child. For the little ones on Solo Santa Tickets, we have a tot size pedal plane and runway outdoors, great for pics! Adults €7.50 includes Tea / Coffee and Mince Pie. 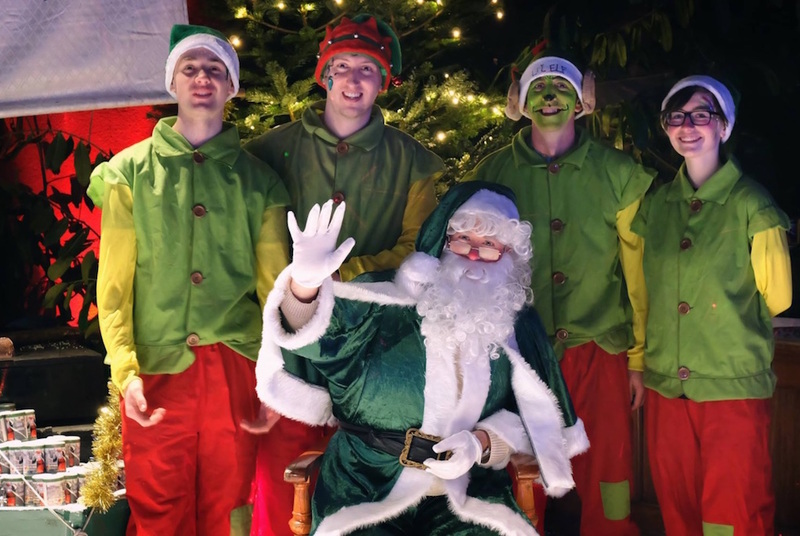 Visit Santa at Rancho Reilly’s Magical Christmas Experience December 14th, 15th, 16th, 21st, 22nd & 23rd, complete with Elves Workshop, Christmas Carriage and of course a visit with the Big Man himself. Tickets cost €15 For All Children Over 1. €6.00 for Children Under 1. €6.00 per Adult. ​The Castle will be full of Christmas cheer with wonderful decorations, miniature railways, vintage Italian nativity scene and of course the big man himself… Taking place in December tickets €14.50 per child (includes gift and hot chocolate), €7.95 per adult. Delta hosts its very popular Christmas Fair and Outdoor Lights Display from December 7th 2018. As well as a colourful display of outdoor lights will be on display in the sensory garden plus Christmas competitions and much more each day, you can visit Santa’s grotto, Elves workshops and festive face painting will be available from 12pm to 6pm on Saturdays and Sundays (online booking essential). Sensory Santa Experiences will be available. Tickets are €10 per person, €30 for a family of 4, €40 for a family of 5, €50 for a family of 6. In Co. Monaghan, visit Santa’s Lodge at Nuremore Hotel and Country Club for a lovely Christmas experience. Santa will be there on dates from December 1st to 23rd 2017. 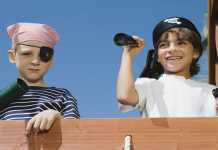 Tickets are €12 for kids and overnight packages are from €130 per family. Over to you now. Have we missed a free or great value Santa experience from our list? Tell us in the comments below.